I have been painting all my life. In high school I used oil paints on canvas. Then, I began to experiment with oils on metal. During college I was introduced to acrylic paint and fell in love with this quick drying medium. I categorize my paintings into 2 eras: B.C. (before children) and C.D. (after driving). As a school teacher, I needed a stress reliever, so the idea of painting became a natural outlet. Before out children were born, I painted for family and friends. I also taught a painting class through the local adult education network. When our children entered the driving state, I found I had available time to begin painting again. While teaching an entrepreneur unit in school, I too decided to put into practice what I was teaching so I began my craft business. I started by doing 2 local shows. As the years have progressed, I have managed to maintain my craft business while still teaching full time. When I retire I hope to direct my full attention to my painting. I enjoy painting all types of subject matter for various reasons. When I paint snowmen, santas and angels my main concentration are the eyes because I believe they give the figure magic. The eyes of wildlife are also important to bring the animal to life. 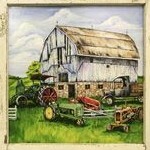 When I paint buildings, especially old barns, I look for specific details which give them character and make each unique. It is so rewarding to see the delight which my painting brings to a person who has special ordered a painting of a personal place or memory. I believe as an artist I not only paint in the present, but help preserve the past. 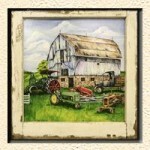 This is why I began to paint on antiques and collectible items. I view it as a way of recycling the old by giving it a new life. I try to match subject matter with the item I paint upon. I also enjoy going to antique shops, auctions and sales, so both of my passions work together into one art form. I guess you could say I have the best of both worlds! My business is called Cooper Crafts. It began as a project which I assigned my students the task of writing a business plan, so I decided I should do the same. I began showing at small local craft show and fairs. As I gained confidence in my work and the ability to sell to sell it, I decided to apply as a juried member to Best of Missouri Hands. After contacting a few members for tips on how to apply, I submitted my work. I was pleased to be accepted into this prestigious organization. Soon afterwards I read about the call for artists to apply to demonstrate and show at the Fall Harvest Festival at Silver Dollar City. For the past six years I have painted, demonstrated and promoted my business and also Best of Missouri Hands at Silver Dollar City.